The change of seasons is upon us. The green of summer torched and whisked away by arctic winds, in a northern land where even the sun takes shelter among the gray timber, its feeble rays flaring gold upon defiant aspens. 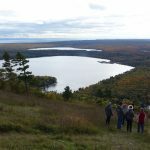 Looking out over the Keweenaw from Mount Bohemia. Lac La Belle from Mount Bohemia. Where are all the photos!?! Summer 2016 was a good one. A lot of cool pictures to share, but due to space constraints, I will post those to my Facebook and Instagram. 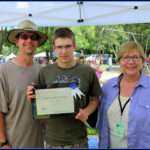 Metsami Creations was awarded best of show for “Artists in the Round” at the July Hiawatha Music Festival in Marquette. As usual, the festival did not disappoint, with great performers, great fun, and great weather. Won best of show at Hiawatha Music Festival. Glow table and light up case were real head turners. Deep cycle battery provides enough power for the wood burner and display case for the weekend. Uncle and I not quite ready for the photo. M35A2 making a scene at Hiawatha Music Festival. 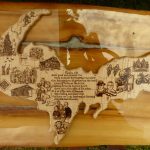 A good friend of ours requested a memorial piece to be made for his son, featuring a collage of family photos on a curly maple hand cut Upper Peninsula. Was the last art vendor to break down as the light case continues to draw attention. Glowing resin in dim dining/bar light setting. Time exposure of glowing resin crack filler. Glow table in bright light. Glow powder in the resin looks like ice or water. Resin has a high gloss look. Different light angles have dramatic effects. 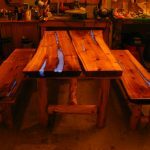 Northern White Cedar table set. 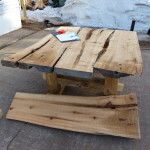 Table top is cut from a reclaimed beam taken out of the foundation of an old building in L’Anse, that was built in the late 19th or early 20th century. Cedar tree itself is estimated to be around 110 years old. This thing was growing over 200 years ago! 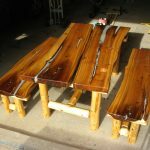 Log legs and support cross pieces are also made of cedar. 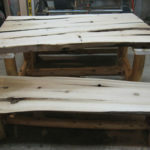 Table is 100% northern white cedar! Bark was hand peeled while wet, so few draw knife marks. Table and bench tops coated in epoxy resin with glow in the dark resin filler in the cracks. Legs are finished with Waterlox tung oil. Table is made to come apart. Table tops unbolt from the bottom and both legs come off. Center beam between legs is not glued. Tiny guide holes have been drilled for addition of lag bolts if needed. Table and benches (to some extent) can self level. Ikea-like disassembly for easy transport! Table measures 5’x3’x30″. 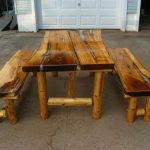 Benches measure 5’x1’x16″. Seats 6. Appraised retail value is around $5000. Took about 2.5 months to build. Will consider any reasonable cash offers. Delivery available anywhere in U.P or northern Great Lakes region. Table is in storage. Make appointment to view. This winter looks very interesting. Conflicting ocean temperature patterns and trends will make for a complicated forecast and the potential is there for a banner year in terms of snowfall over the Great Lakes area. I am putting together a forecast and it should be available this week. Stay tuned. For those of you who follow Metsami Creations, you may have found the website has not been updated regularly. Over the past 6 months I have been very busy with projects, and my website has been slow and buggy. I have switched my hosting to a friends company, Carlson Media LLC . The update has allowed for faster speeds and better reliability. I hope to keep my website updated regularly now, however, there are some update issues with the theme I am currently using. The conversion from my current outdated theme to the new seems rather tedious. Hopefully I can keep the site up in the meantime while I research the update process or find a technician to assist with the issue. In the past six months I have completed several major projects. 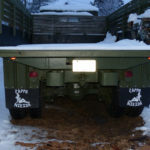 Those included the restoration of the M35A2, completion of a massive 5’x10′ timber frame dining set, my best stump table, old growth cedar picnic set, and a case to display my jewelry at shows. 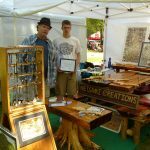 This Spring I was invited back to be an Artist in The Round vendor at the Hiawatha Music Festival in Marquette that takes place in mid July. Last year was the first time I attended the festival as a vendor. 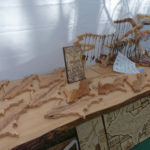 My pyrography and woodwork display won an honorable mention. This is impressive, as there are several dozen vendors and only two awards, first place, and honorable mention. For some vendors, it took several years of attendance before winning an award. Metsami Creations also won Best of Show for art at Mining the Arts festival in Republic during Memorial Day weekend 2014. Here is to a year of continued quality craftsmanship and impressive displays! 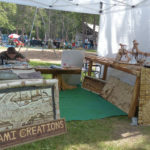 Metsami Creations display, Artists in The Round, Hiawatha Music Festival, Marquette MI, 2015. Honorable mention award. Artists in The Round, Hiawatha Music Festival, Marquette MI, 2015. During 2015, I had spent a great deal of time restoring the M35A2, inside and out. 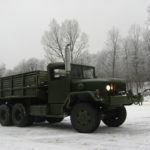 Truck was repainted, cab redone, bed liner sprayed, bearings re packed, brakes adjusted, fluids changed, and filters changed. 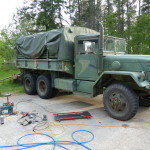 Although I had no prior experience in heavy truck mechanics and body work, I would say my efforts led to decent results. 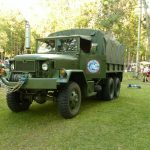 Yes there are some continued rust issues and paint adhesion problems, however, those can be fixed over time and overall the truck is in great mechanical shape. Picking up the M35A2 from New Richmond Wisconsin, back in June 2013. M35A2 made it 300 miles home just fine and got 14mpg! 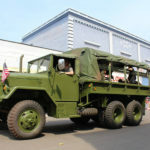 M35A2 in the 2015 Ishpeming Independence day parade. M35A2 Against a backdrop of icy forest. Me standing in front of the M35A2 getting ready for the 2015 Ishpeming Independence Day parade. 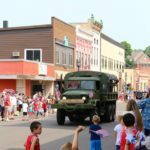 M35A2 in 2015 Ishpeming Independence Day parade. Crowd was impressed. Me standing in front of the M35A2. 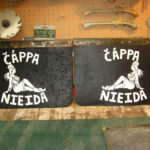 Čáppa Nieida means “pretty girl” in North Sámi, and is the name of a rock song by the Norwegian Finnmark heavy joik band Intrigue. 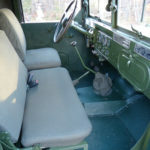 Restored cab of the M35A2. 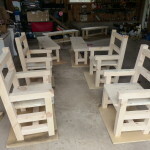 Timber Frame Dining Set Complete! 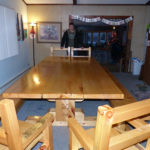 On Christmas Eve, my dad and I delivered the 5’x10′ timber frame dining set I had been working on for most of 2015, just days after finishing it. Pretty good job for a first attempt at a project of this magnitude. Lumber was sourced locally. 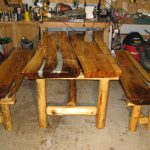 I helped cut it on a band mill, or milled the lumber directly with a chainsaw mill, hauled it, dried it in the kiln, machined mortises on a horizontal drill press, and cut the tenons for the table frame with a circular saw. I squared the joints up with a chisel. 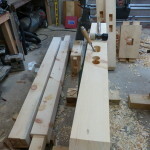 The chair tenons were cut with a 90 degree shoulder tenon cutter on a 3/4 inch drill. The 90 degree tenon shoulder hides the joint. All parts of the table were sanded with a hand held belt sander. 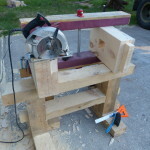 Benches were planed with an electric hand planer. 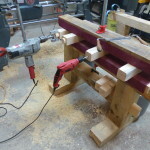 A jointer was used to clean up some of the chair components and a chainsaw mill was used to resaw the twisted table tops to make them flat again. This project took up most of the space in my shop and the garage for about a year. I hope to expand operations eventually to be able to manufacture pieces of this magnitude on a regular basis, but until then, I think this is the last big table for awhile. 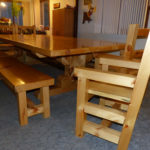 5’x10′ Timber Frame Dining Set. 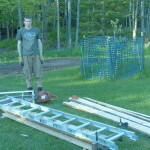 Me standing next to 5’x10′ Timber Frame Dining Set for scale. This winter I have also completed my second stump table. This was a big one, 5′ long and 26′ wide. If was for a client buying through the Flying Moose. 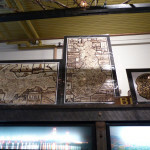 The client was impressed with the quality and a price of $1200, when most pieces of this magnitude retail for over $1500. 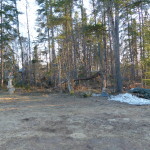 Top slabs are white pine, and the stump is northern white cedar. 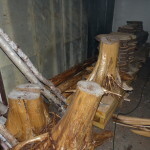 Table tops were cut on the chainsaw mill and dried in the kiln. 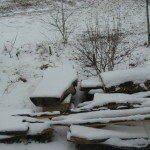 White cedar stumps were dug out by hand with shovels, axes, and chainsaws. 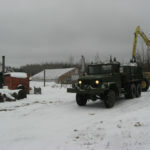 Stumps are pulled, skidded, loaded, and hauled with the m35a2. A 3000psi pressure washer with turbo nozel removes bark that can not be peeled by hand. Bottoms of stumps are cut flat freehand with chainsaw and 36 inch bar. 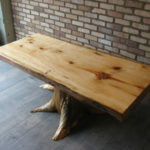 White pine slab and cedar stump table with epoxy finish. 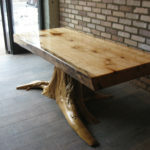 Table top is cut from a beam taken out of the foundation of an old building in L’Anse MI from the early 20th century. Cedar tree itself is estimated to be around 110 years old. This thing was growing over 200 years ago! Log legs and support cross beams are also made of cedar. 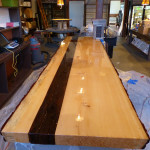 Table is 100% northern white cedar! Bark was hand peeled while wet, so few draw knife marks. 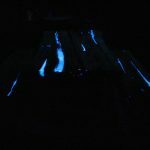 Next step in the project is to fill in the cracks with epoxy mixed with blue GLOW IN THE DARK powder! After the filling is complete, an epoxy top coat will be applied. Legs and cross beams will be finished with Waterlox Tung Oil. Lots of hours and coin sunk into this table and the finish has not even been started yet. Should look amazing when finished! Table is made to come apart. Table tops unbolt from the bottom and both legs come off. Center beam between legs is not glued. Tiny guide holes have been drilled for addition of lag bolts if needed. Old growth white cedar table before epoxy finish. Lots of expensive supplies needed for a glow in the dark table. Over the past year my skills at pyrography on antler jewelry have improved significantly. Jewelry is made of polished white tail deer antler, most from Michigan, and some caribou from Alaska. The wire wrapping has been done by my neighbor Great Lakes Gems . 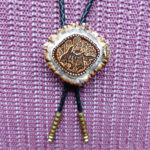 Check her page out for recycled bicycle, natural material, and jem stone wire wrapping! This winter I have built a repurposed portable jewelry case, with double doors that open into legs. I am now working on adding battery powered LED light tape inside for night use. If the results are good, I hope to someday manufacture these cases for sale. U.P. Power Bolo. Wild Upper Peninsulas chasing after their natural prey…Lower Peninsulas. 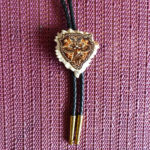 This bolo features a design that I designed as a tattoo for a friend. Mutant combination of pheasant, mallard duck, whitetail deer, holding a trout. Not much pyrography has been done on wood this winter, but I did do this custom project. 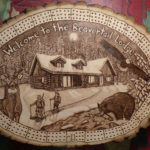 Custom cribbage board I did for a client using the actual picture of their cabin. This Spring, Metsami Creations has been busy composting hundreds of pounds of kitchen waste, horse manure, leaf litter, and cardboard. 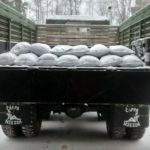 Large orders of castings (worm manure) have been going out to several local farms, including Seeds and Spores Family Farm, Ravine River Homestead, and Virgin Earth Farm. 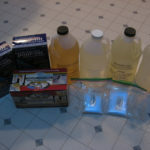 Metsami Creations has also delivered worm castings from Partridge Creek Farm. Over the past month, Metsami Creations also has acted as a consultant for the design and operation of a large scale compost and worm casting operation with Partridge Creek Farm. Thru the consulting process, I have gotten to know a great team of volunteers and professionals at PCF, who have big visions of promoting agriculture, education, and sustainability in the community! 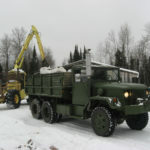 We hope to eventually provide large scale biomass recycling services for the Marquette County area and supply the Upper Peninsula with compost and vermi compost products at competitive prices, meeting a growing soil building demand that must be supplied by manufacturers in Wisconsin. Planning is currently in the works, albeit the beginning stages. The process includes getting permission from the city, permits, solving logistical issues, and meeting with other business professionals. Metsami Creations has been conducting research and the design of a business plan which will be finalized with the help of Northern Michigan University. Pallets were loaded in back of M35 from tractor trailer with pallet jack. Ramp was needed to bridge the gap. Hauling 3 tons of worm castings. 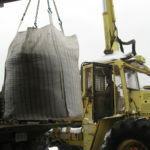 Lifting 1 ton supersack of worm castings from the M35A2. 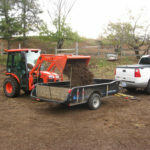 Picking up horse manure for worm farm. Unloading by hand is fun. New shipping method for castings. Now packaged in 40lb bags. Delivering 1000lbs of castings in 40lb bags. 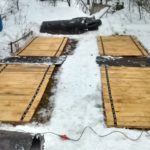 Roll up worm farm lids are made out of white pine and spruce bound together with straps. 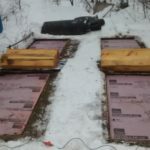 Insulation panels in worm farm. Farm is heated with a wood furnace and electric heating cables. Warm farm open and fed kitchen scraps. 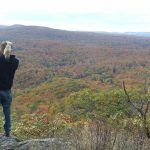 Over the past year I have been working with the owner of Virgin Earth Farm in Witch Lake MI, in southwestern Marquette County. Due to labor shortages and similar interests for future business ventures, plans are in the works for Metsami Creations to move from Ishpeming to the new location. 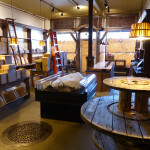 The idea was brought to the table last Fall, and given that I had made plans to continue working at the home shop for a few years, this is a significant development and change of operating procedure. Continue providing quality natural produce to the northcentral U.P to feed a growing market for farm fresh produce. Production of high end woodwork, art, jewelry, and duodji, hand made with locally obtained materials and inspired by our Nordic ancestors. Fostering pride, continuation, and education of Nordic and Indigenous Sami culture in the Upper Great Lakes. If the business proves to be efficient and profitable, a future dream will be to raise, breed, and exhibit reindeer. 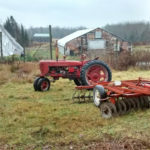 Much planning and work will need to be done at the new location, such as improving the farm for maximum efficiency, cutting logs for construction, and the design and construction of a large wood, metal, machine, and truck shop. I also hope to build my own cabin, just like my ancestors. Keeping sustainability in mind, effort will be made to utilize recycled and locally obtained natural building materials. Structures will be designed for energy efficiency comfortable off grid living, with the purpose of saving energy, disaster preparedness, and back to nature conservative living. 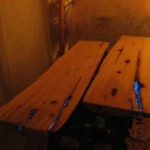 Getting loaded up with a cord of maple to heat the shop. 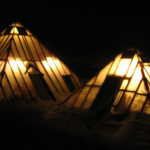 Wood heated pyramid greenhouses in mid winter. Leafy vegetables still grow inside. 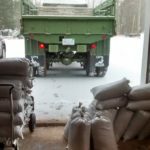 Delivering 3 tons of worm castings. 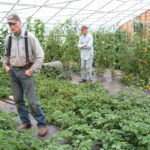 Farmers working in the greenhouse. Looking over the fields at Virgin Earth Farm. 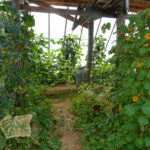 Pyramid Greenhouse at Virgin Earth Farm. I hope to update the blog more often, however, I do caution that I had promised to update sooner on multiple occasions, and I ended up updating it many months later. That is why I have a half years worth of blog posts in one long post. I do try to update the Metsami Creations facebook page more often with the latest adventures. I am also getting an Instagram page set up to increase audience. As for the weather, a major stratospheric warming event (north pole warmer than normal) has displaced the polar vortex south over northeastern Canada for most of April. 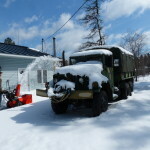 The first week of April produced over 40 inches of snow for the northcentral U.P. 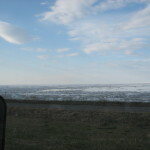 However, with temperatures in the 60s, 70s, and even 80s in mid April, all but the largest snowbanks have melted. 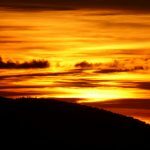 For the rest of April, the effects of stratospheric warming are coming back. A significant blocking ridge of high pressure is developing again over Greenland, leading to a negative North Atlantic Oscillation and Arctic Oscillation. End result will be a return of cold over eastern North America, the heat over the northwest. Mean northern stream trough over the Great Lakes and a southern stream trough over the Rockies will lead to a strong baroclinic/temperature difference zone over the Plains and Midwest. Through the end of April, very heavy rain is likely over the Plains, with severe weather possible, especially over the Mississippi Valley. Snow is once again possible in Denver. The most likely outcome for the U.P will be to have rain showers, possibly mixing with snow at night, and temperatures averaging in the 40s. There is also a chance the storm storm system could track further north, resulting in thunderstorms and milder temperatures, or it could draw in enough cold air to lead to a surprise snowstorm, but this is very unlikely. 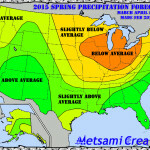 The current weather pattern is very similar to the past few years, with a weak El Nino type pattern going into Spring. El Ninos (warming of central and eastern) equatorial Pacific typically result in warmer and drier winters for the Great Lakes, but cooler and wetter Summers. Springs are drier, but typically lean towards the cooler side, especially in late Spring. However, the El NIno is rapidly weakening ENSO neutral conditions, and a weak La Nina should develop by Summer. Starting in May, the cold trough over northeastern north America should break down and be replaced with upper level ridging, as a more zonal jet stream flow takes over. Latest data and analog years suggests the end of Spring and the first half of Summer will be hot and dry over the Great Lakes. The developing La Nina later in the Summer combined with the Arctic finally cooling below normal, should result in an active late Summer severe weather season for the Upper Great Lakes as a strong zonal flow develops and troughing digs into the northern Plains. The upper air circulation pattern should also favor a greater chance of Hurricanes in the Gulf of Mexico. Continuing into Fall the Winter, temperatures will likely average below normal with well above normal precipitation and snowfall. The intensity of any arctic cold will depend on the amount of blocking. Siinä kaikki ja hyvää päivää! The Flying Moose is Open! The Flying Moose in downtown Marquette, owned by my friend Jeremy Poch and his wife Melanie, has now been open for several weeks. 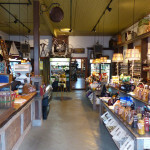 It is a modern “old time” general store that features a great selection of local farm produce, meats, organic foods, beer, outdoor gear, bikes, local artwork, and woodwork. 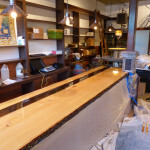 They also hope to have a deli with sandwiches up and running within the next few weeks. The store is located in the old Hockey Central building on the corner of Washington and Fifth street, near the Ramada Inn. 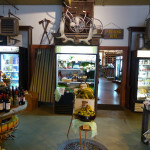 The store front is easily spotted, with a cart of fruit on the sidewalk surrounded by a herd of bicycles and patio furniture. 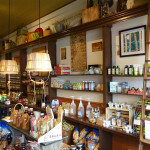 In less than a year, the building went through a remarkable transformation from disrepair to an operating general store. 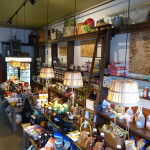 With its rustic woodwork, antiques, library roller ladders, and old time character, it is one of the most unique shops in Marquette. The work is still not done. The side garden still needs edging and there is talk of building a decorative store front. The plan for the garden involves planting organic fruits and vegetables along with wildflowers. The garden will be fertilized with Metsami Creations worm castings, to highlight the results of my product. 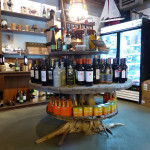 I took some pictures of the store yesterday afternoon, and unfortunately there was construction on the sidewalk which prevented me from getting a good picture of the store front with the sign and product display. Inside The Flying Moose in Marquette Michigan. 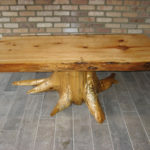 Cedar stump table I built inside The Flying Moose in Marquette Michigan. Metsami Creations pyrography display inside The Flying Moose in Marquette Michigan. 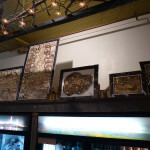 Artwork and produce inside The Flying Moose in Marquette Michigan. 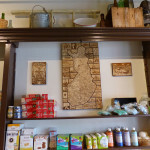 Metsami Creations cedar stump table, cribbage boards, and prints in the back room of The Flying Moose in Marquette Michigan. Due to popular demand I have made prints of most of my best pyrography. The prints are printed on professional photo paper, matted, put on a foam backing board, and a protective plastic sleeve has been put over them. I can frame the prints, but due to a shortage of birch logs I did not make any frames. 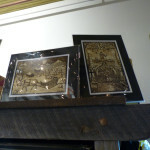 Pyrography prints in the back room of The Flying Moose in Marquette Michigan. 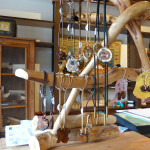 I also have some deer antler and burl jewelry on display. 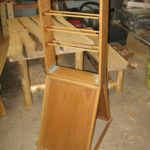 I am using a display rack I borrowed from my neighbor but I am working on building a standing display case. Deer Antler and Burl Jewelry by Metsami Creations and Great Lakes Gems inside The Flying Moose in Marquette Michigan. Metsami Creations pyrography inside The Flying Moose in Marquette Michigan. I also did a little custom woodwork in the store. I milled a counter top slab that was 30 inches wide and 10 feet long. 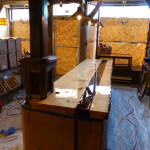 The counter top slab was milled from a white pine at Pinecrest Resort in Republic Michigan. After I milled the slab I dried it, hand planed it, and poured epoxy over it after the contractors added the barn wood strip. White pine counter top I milled, dried, hand planed, and epoxied. Contractors added the barn wood strip. 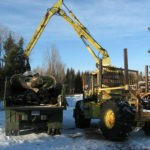 Tree was cut at Pinecrest Resort in Repubic Michigan. White pine counter top I milled, dried, hand planed, and epoxied. Contractors added the barn wood strip. Tree was cut at Pinecrest Resort in Republic Michigan. 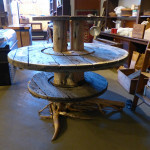 I also built a display table out of a cedar stump and some cable spool end pieces. 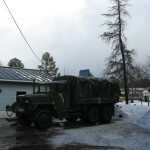 The cedar stump was pulled out with the winch and hauled home on the M35A2. I debarked the stump with a rotary nozzle and 2800 psi pressure washer, cut the bottom flat free hand with my 394xp chainsaw and a 36 inch bar, and then put it in the wood kiln to dry over the winter. 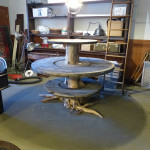 Before assembling the table I cut the stump and tree trunks into quarters, made dowel templates in the spool ends and stump sections, and then put it together using the dowels. Cedar stump cable spool table and counter top I built. Display table I built out of a cedar stump and cable spool ends. It is held together with large dowels. If you have noticed, I posted new adds for The Flying Moose in the top slide show and right side bars featuring their logo. There is also an add for Pinecrest resort on the right and an add for my cribbage boards at Things To Do In The U.P in the top slideshow. These business have worked with me a lot and I hope visitors to this site support them with their patronage. The change of seasons is upon us. It has been a warm September so far, and it looks like it will continue into early to mid October. The trees are beginning to change color, although a bit slower than normal. The warm temperatures will delay the color change somewhat, but the sun is the main driver of the reduction of chlorophyll. 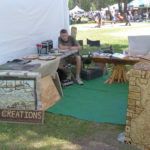 This Summer I have spent most of my time working on restoring the M35A2, however I did do some pyrography, woodwork, and jewelry to sell at the Hiawatha Music Festival and of course the Flying Moose. 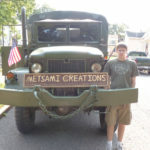 Over the next few weeks I hope to be able to post some more blog posts with recaps on the Ishpeming Fourth of July Parade, the Hiawatha Music Festival, and my truck restoration. If you noticed, I did not post a summer weather forecast this Year, although I am working on my Fall and Winter weather forecast. Those of you who like warm and dry weather will be thrilled! It has been awhile since I have given an update. There has been a major change of plans this Winter and Spring that I have been kind of keeping a secret. 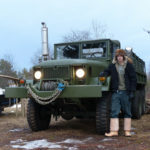 This year I was hoping to go to various art shows and farmers markets around the U.P in the M35A2. However, an opportunity opened up for me to sell my products at a store on Washington Street in downtown Marquette. I also found that the M35A2 is beginning to have some rust issues and needs some preventative maintenance done before it can be used heavily. 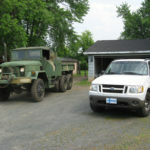 Therefore I am in the process of repainting the truck, changing fluids, filters, adjusting brakes, and greasing bearings. 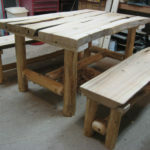 I have also been very busy building a massive dinning set for someone in my family. 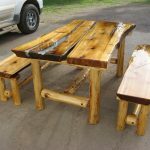 The dining set is made out of white pine and put together timber frame style with hand chiseled mortise and tenons. 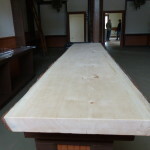 The table top is 5x10ft and 3 inches thick, and has two captains chairs at each end and two benches on the sides. If you want to follow the progress of restoring the M35A2, I have a thread on Steel Soldiers detailing my build: UPFINN’s M35A2 Build. It would take too much storage space to log the progress on the Metsami Creations website. 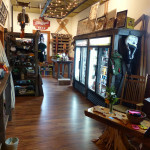 I have decided not to attend any art shows or farmers markets to keep my inventory up in anticipation for placing my products at a new store in downtown Marquette called the Flying Moose. I will also be a vendor at the Hiawatha Music Festival the weekend of July 18th. Many are wondering when I will set up my online store. I have decided to put it on hold due to the reason I will not be attending any shows, and that is inventory. I have completed all of my business paperwork, licensing, and financial accounts in preparation. 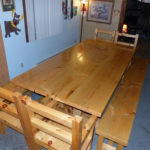 Right now I am trying to get the dining set and truck done at the same rate, as I would like deliver the table with it. My worm farm is also increasing production as local farmers make bulk orders for castings. The weather this May has featured mild temperatures and a dry start, with large amounts of rain to end the month. In the end of May we picked up around 5 inches of rain, enough to put a good dent in our developing drought and raising river levels higher than what was experiences during the Spring thaw in late March and early April. On thing for sure is that the green-up is several weeks earlier than last year, with all trees in leaf as of June 5th, but some time is needed before they reach full size. Memorial Day weekend was at the very end of May last year and the leaves were just coming out. This year, some leaves were coming out in early May, with some trees full of small leaves by mid May. Although May 2015 has been overall warmer than normal, we have had some very cold nights. The weather pattern we have had over the Winter with the west coast ridge and east coast trough has persisted, although weakened significantly. As the jetstream becomes weaker in the warm season the wavelength shortens, and we get a trough over the Plains with a ridge on the west and east coast. There is also persistent cold and troughing over northeastern Canada. The Great Lakes area is stuck between the trough over the Plains and northeast Canada in a weak ridge resulting in mild weather, however when the troughs connect we get very heavy rainfall and anomalous cold. Behind the frontal passages during the last half of May is has gotten very cold, with temperatures at night falling to around 20F with snow showers even during the day!. If this pattern continues through the Summer, it is likely we would have another cold winter as eastern trough amplifies. However, the El Nino (warming of the central and eastern equatorial Pacific) is much stronger than last year, which might help a westerly flow develop bringing in mild and dry Pacific air during the Fall and Winter resulting in warmer temperatures and less snow compared to past Winters. As for the frost and freeze, I expect a lot of the wild berry and fruit blossoms have been damaged due to the extreme cold in some areas. Around where I live there still seems to be a good amount of green blueberries and service berries, although it might be much worse in other areas. The choke cherries are just beginning to blossom, with most other fruit trees are in blossom or just finishing. I did not make a Summer forecast yet, however for Upper Michigan I think we will have temperatures near normal with above normal precipitation. It will not be as cold as last Summer, but I do not expect there to be many heat waves either. 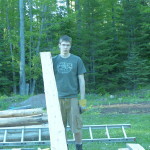 Last weekend I took a ride to my uncles place and cut up some northern white cedar poles. I thought they would be too small to mill, but I was able to get the slabbing rails to fit. I also had to put the logs between two boards to keep them steady. This system works good for cutting half logs and beams but I would not waste the wood cutting thinner boards. You can see in the background how much the leaves came out during the end of May. Here are some pictures of the process of cutting the mortise and tenons on the dining table project. I will do a full post later on the project when it is completed. I have quite a few furniture and woodburning projects planned for the summer. 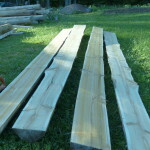 Here are some of the interesting lumber pieces and stumps that will be used in my work. I cut, hauled, milled, and dried everything myself. How cold has Spring been so far? Despite a slightly cooler than normal Spring, we have had a few very warm and dry periods. A nice warm up in mid March with temperatures into the 60s gave way to cooler weather for the end of March through early April. A quick hitting late season snowstorm impacted the area on April 10th dropping near a foot of snow in the higher terrain of the northcentral U.P. The snow did not last, as temperatures reached the 50 degree mark a day after the storm, with temperatures in the 60s and lower 70s the week after, however anomalous cold and snow set in to end late April. 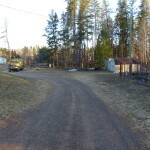 It is beginning to warm again now and the snow is gone in all but the darkest places and snow banks in the higher terrain snow belts. Below is a iframe of March and April temperature records from this year and last year at the National Weather Service Office. This Spring so far has been quite a bit warmer than last. March 2015 was 0.3F above normal, while March 2014 was -8.6F below normal. April 2015 has been -0.1F below normal, while April 2014 was -4.8F below normal. For snowfall, our snow depth is 0 inches as of April 28st, while in April 2014 we kept at least a trace of snow through the entire month. 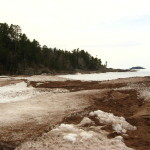 Ice on Lake Superior is much less this year than last. Ice coverage was at 26.9% on April 17th, while last year it was at 64.4%. Lake ice 2015 compared to 2014. 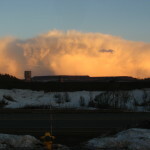 Convective sleet clouds over Empire and Tilden mines on April 10th, 2014. 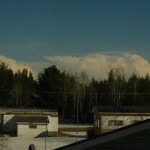 6 inches of snow left on April 21st, 2014 with convective clouds in the background. 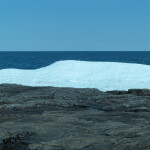 Ice at Presque Isle, Marquette MI on April 27th 2014. 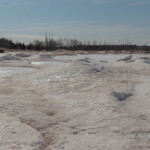 Ice buildup on beach below Sugarloaf Mountain on April 27th, 2014. 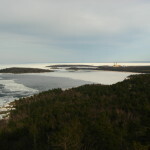 View of ice on Lake Superior from Sugarloaf Mountain on April 27th, 2014. 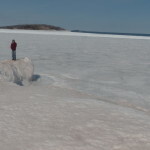 Lake Superior ice cover on MAY 17th 2014! 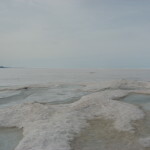 Ice at Presque Isle April 5th 2015. 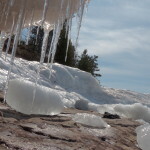 Icicles at Presque Isle, April 5th 2015. Ice mountains and volcanos at Presque Isle, April 5th 2015. Open water north of Presque Isle, April 5th 2015. 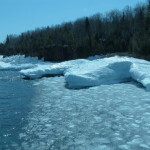 Ice buildup at Presque Isle Black Rocks, April 5th 2015. 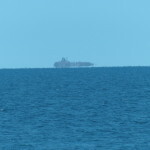 Granite Island mirage north of Presque Isle, April 5th 2015. My dad snowblowing 11 inches of wet snow on April 10th, 2015. 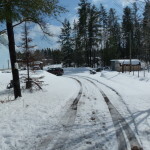 Snow along driveway on April 10th, 2015. On April 26th 2015, most snow was gone except for a few snowbanks. 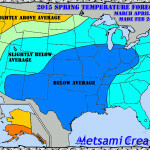 How has Spring matched our winter forecast so far? **Note** This data was the most up to date I could find. Precipitation is in millimeters and temperature in kelvin. Thankfully, the weather pattern has proved less cold that thought. Precipitation patterns were also different. This model has a warm bias, but it is forecasting warmer than normal temperatures with precipitation near normal to slightly above. I think we will have drier weather this May than the model forecasts. Model data has backed off on the extreme cold for early May and now shows significant warming, which seems probable given current conditions. Welcome to Metsami Creations! This is my first blog post. The past weeks have been spent transitioning between from Winter to Spring operations. 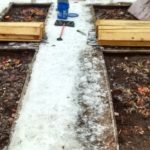 The transition featured a lot of hydrologic issues that were taken care of through removal of snow, digging, a submersible pump, and a shop vac. 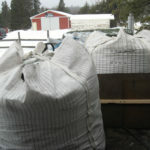 Firewood has also been restocked, worm farm dug out, new lumber moved into the kiln, and truck washed. 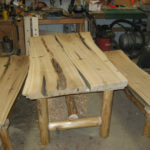 As for shop work, I have been sanding and cutting posts for dining set benches and chairs. Lots of interesting tasks to share later. 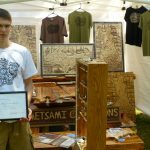 Metsami Creations featured in the Great Lakes Logging Magazine! 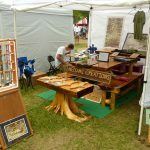 Back in August I had a display at Finn Fun Day in Negaunee, and met a editor for Great Lakes Logging Magazine . This winter I was suprised by a email that the magazine will be adding an article about Metsami Creations in their Spring edition. The Spring edition of Great Lakes Logging Magazine has just been published and my article can be found on page 30! The publication is very well done so take a look! It is exciting to have a story in this publication as it is read by and advertised in by leaders of the Great Lakes forestry industry. If you don’t know, I also have a interest in forestry so I think this is really cool! Metsami Creations “Writing with Fire” in Great Lakes Gazette! 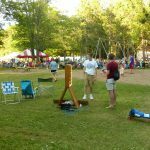 Back in June at the Midsummer Scandinavian festival I met a reporter for Great Lakes Gazette. This article was posted in October and I never noticed it until later this Winter! The link was in a comment on the site that got hidden as spam. I found the link and posted it here! Another well done article! Also this reminds me, I have taken care of the spam problem in the comment section and have opened up registration on the forums if you have any questions to ask or things to talk about. Cold and snow for the next 7 to 10 days, followed by warm up. As for weather, the warmth has come to an end. We are back to the familiar west coast ridge and east coast trough pattern that has brought the Great Lakes area extreme cold for most of the Winter. The North Atlantic Oscillation and Atlantic Oscillation have dropped back into the negative phase and the Pacific North American pattern is positive. MJO index reached record levels in phase 7 last week, resulting in a strong westerly wind burst over the westerm Pacific Ocean, which promoted warmth over the central United States and a strengthening of the El Nino. The MJO is heading through phases 8, 1, 2, and 3 right now which will favor cold. This current weather pattern favors cold and snow over the next week, and indeed temperatures have been cold (20s) and we have a chance of receiving a half foot of snow this Wednesday. There are signs around 10 days from now the weather pattern will change toward warmer with a ridge developing over the central US. More on this later. Hyvää yötä ja siinä kaikki! Good night and thats all!